The Shoulder – a simple ball and socket joint that becomes very complicated when pathology strikes. Compared to treating the spine, the shoulder has lot fewer and modifiable variables that can prevent chronic issues. To simplify: when I say the shoulder, I will be talking about the glenohumeral joint (GHJ) – where the humerus meets the scapula (upper arm to shoulder blade). We are talking about pathology at the GHJ, but without mobility and stability from its partners (thoracic spine, cervical spine, scapulothoracic, acromioclavicular or the sternoclavicular joints) the shoulder will not function optimally. Most patients I see in the clinic that present with chronic pathology around the GHJ could have been prevented. In other words, too many movements or too forceful of movements with not enough rest in between is a recipe for overuse pathology. The key for shoulder longevity is to find the balance between tissue tolerance and tissue loading. Depending on the degree of damage in the pathologies above, surgery may be warranted. What most people fail to understand is that the dysfunction in the structures around the GHJ are usually the culprits. So if you repair something at the shoulder surgically, you are doing all that pain and hard rehab work injustice. The problem is bound to return in the future. Also, the surrounding dysfunctional structures are the ones that can be less painfully changed for better shoulder use. These structures should be addressed in therapy the first time you have a painful episode or notice poor mobility. The big daddy: total shoulder replacement (or reverse total shoulder replacement) is becoming more common of a treatment option for those who have gone through early trauma / injury that was not managed properly at the time. This is the surgery you get because you are no longer able to stand the pain or the mobility is so bad you cannot perform simple daily activities like washing your hair or using the toilet. 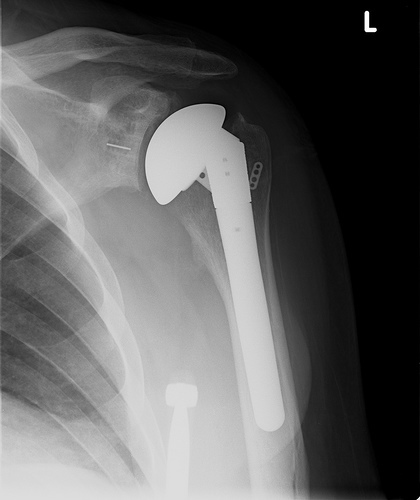 The point I want to make in this blog is that, hopefully, total shoulder replacement can be avoided. Although having a TSR can dramatically reduce pain and disability , the shoulder is far from being “new”. Expectations after a TSR are to improve motion to slightly overhead (120-140 degrees flexion) and just behind the back for activities such as toileting. There is no returning to tennis or freestyle swimming after these surgeries. So, why do people get to the point of having to have a TSR? As I say to many patients: “overuse or underuse” and poor injury management early in life. If you ever pushed through an injury or completely ignored an injury as you waited for it to “heal, ” you have mismanaged your shoulder health. For patients who primarily have arthritis in the joint (wear and tear) and have a good functioning rotator cuff, Total Shoulder Replacement is sufficient (pictured right). As you can see it resembles a normal ball and socket joint like where the upper arm meet the shoulder blade. If the rotator cuff is too damaged to salvage, a Reverse Total Shoulder Replacement (RTSR) is performed (pictured left). Notice how the ball and socket have been reversed to allow for improved lever arms allowing the humerus to elevate for overhead movement. Common procedure is to use the latissimus dorsi (not a rotator cuff muscle) graft to offset the mechanics of the deltoid during overhead reaching. It gets the job done, but limits the variability of movement over shoulder height = rotation. How do you avoid a shoulder joint replacement? a) Rehab your shoulder WELL the first time it is injured — > get your full range of motion back in the GHJ and if needed address your spine limitations. b) Do you shoulder exercises forever — > maybe not 6x/week but at least a couple of days / week. Figure out how to incorporate your rehab exercises into your fitness program to save time. c) Address your ergonomics or work habits –> Everyone is aware that we are becoming more sedentary as technology drives our business. Make sure you set up your desk optimal posture and arrange your day so get enough activity for maintainance good scapulothoracic mobility and stability. Avoid upper crossed syndrome.